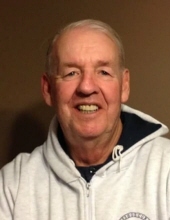 Wilson "Isadore" Troxell Jr., age 77, of Fairfield, PA, died Sunday, January 27, 2019 at Tranquillity at Fredericktowne after an extended battle with Alzheimer's. Born December 9, 1941 in Legore, he was the son of the late Wilson Lamar Troxell Sr. and Eloise Eyler Troxell. "Is" graduated from Walkersville High School in 1961. He served in the U.S. Navy for six years, part of the time on the USS Hancock. He was employed as a fireman with the Glen Echo Fire Dept. of Montgomery County for 33 years. He was a member of the Glen W. Eyler American Legion Post of Woodsboro. He enjoyed spending time with his grandchildren, fishing and golfing. Surviving are daughters, Germaine Crocker and husband Stuart of Altoona, PA and Mindy Schmidl and husband Mike of Smithsburg; 7 grandchildren, Darnetta, Nicole, Katherine, Andrew, Matthew, Morgan and Mckenna; 5 great grandchildren; a sister, Judy Beall of Walkersville and brothers, Nevin (Pete) Troxell and wife Hope of Frederick, Brian Troxell and wife Elaine of Mt. Pleasant and Dirk Troxell and wife Cathie of New Midway; numerous nieces, nephews, aunts, uncles and cousins. He will also be remembered by companion, Dorothea Barrick and dear friends, Ronnie Dorsey, Ronnie Linton, Jerry Crum, Jerry Chipley, Eddie Esworthy, Dave Bancroft and Barry Horner. He was predeceased by a daughter, Bernadette Weedon and a brother, Paul Troxell and his wife Judy. The family expresses appreciation to the extended family who provided loving care for "Is", along with the hospice staff. A funeral service will be held at 7:00 p.m. Friday, February 1 at Hartzler Funeral Home-Libertytown, 11802 Liberty Rd., Frederick, with Rev. Pete (Arthur) Baugher, officiating. The family will receive friends at the funeral home Friday 1-3 p.m. and from 5 p.m. until service time. To send flowers or a remembrance gift to the family of Wilson Troxell, please visit our Tribute Store. "Email Address" would like to share the life celebration of Wilson Troxell. Click on the "link" to go to share a favorite memory or leave a condolence message for the family.